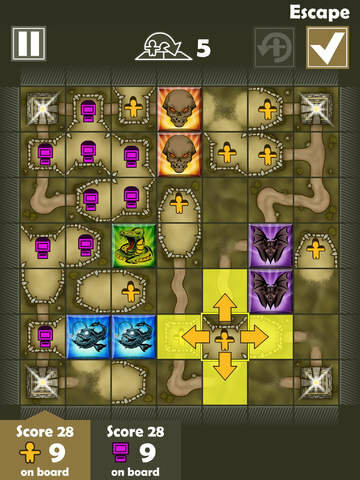 When Lumarama’s quick little tile laying strategy game, Damn Little Town was first released the developer promised online gameplay in the future as well as exclusive content for anyone who purchased the (now $2.99) full game unlock IAP (which removes ads, adds up to 4 player support and the option of a 9×9 gameboard) before the first update. With yesterday’s v1.1.0 update we now know that the special early buyer content comes in the form of some exclusive devil-like meeples. If you haven’t already purchased the full game unlock, you can apparently still get these meeples, as long as you are still running the old version of the app and buy the IAP BEFORE updating the app. We’ve been told that there is no way to get them afterwards so make sure you do it before updating. If you did this, you will then have a “Limited Edition Mode” option and once enabled, the new meeples will appear in the game. Note that they do not appear in the menus or summary at the bottom of the screen, they only show up when you actually place one on the game board. Also coming with the first update is the highly anticipated online-multiplayer mode where you can play against Game Center opponents. And last but not least, there is an interesting new gameplay rule during the Escape Phase of the game with regards to unfinished constructions. Now players CAN move through fields, meaning that just because your settler(s) are in an unfinished construction, they are not completely trapped. However moving within fields is more expensive than moving along a road or building tile. This is a fun little game, and I’m looking forward to some online match-ups. Feel free to send me a game request, my Game Center ID is OTGGamer.